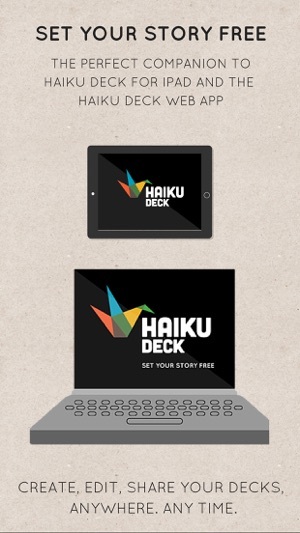 Whether you’re pitching an idea, teaching a lesson, telling a story, or igniting a movement, use Haiku Deck to create beautiful presentations that wow your audience. Create, Edit, View any time, anywhere. * Designed to encourage presentation best practices, such as simplified text, high-impact imagery, and clean, consistent formatting. * Powerful image search, with automatic sizing and attribution, puts over 40 million free, high-quality Creative Commons licensed photos at your fingertips or add your own images from your camera roll. 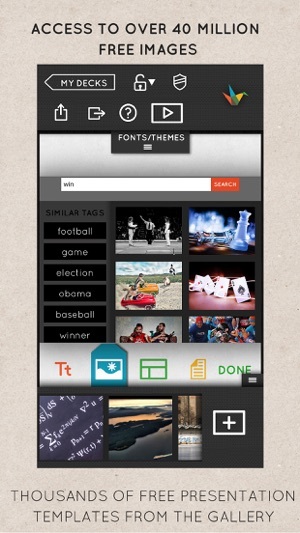 * Apply stylish, professionally designed fonts and layouts with one tap for a cohesive, polished look. 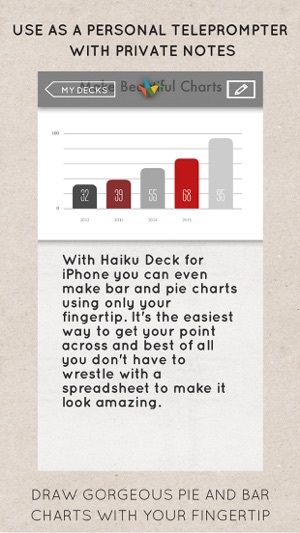 * Use touch controls to create flawlessly beautiful pie charts, bar charts, and stat charts. * Streamlined list and multiline text templates offer additional detail without clutter. 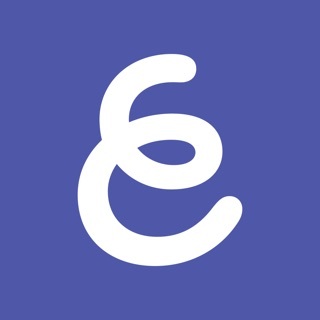 * Import and edit images from your iPad, Flickr, Instagram, Facebook, Dropbox, or other online sources for a personalized touch. * NEW! Create decks on your iPhone! 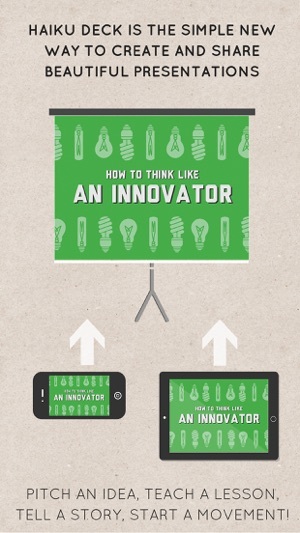 * View or present decks with an iPad, iPhone, projector, or any web browser. * Easily share decks via email, Twitter, or Facebook. * Easily embed decks or export to PowerPoint, Keynote, or PDF. 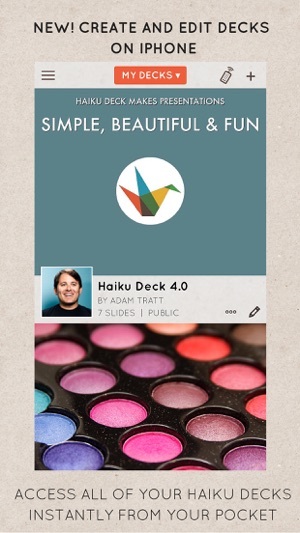 Subscribe to Haiku Deck Pro by tapping 'Get Pro' inside the app! Subscription price varies based on your chosen renewal period, your country, and eligibility for educational pricing. The price will be shown in the app before you complete the payment. The subscription automatically renews each renewal period unless auto-renew is turned off at least 24 hours before the end of the current period. Your iTunes account will be charged within 24 hours prior to the end of the current period for the same duration to ensure no lapse in service. No cancellation of the current subscription is allowed during the active subscription period. You can turn off auto-renew at any time from your iTunes account settings. Optimized for iOS 12 with numerous updates as well as a few bug fixes. Good for presentations but nothing ever comes for free. As soon as it costs money it spoils everything. I will still try to be creative but within my limited use of the application because of financial constraints. Congrats on this great app! I managed to deliver a powerful yet fresh presentation with less than ideal preparation time! I had a very small window of time (2 hours flight to London) in order to create this presentation, but the result was enough to have people asking right after the presentation not only about the subject-matter but also about the app... It was only a small intro meeting and my original goal was to create something original and avoid people from following asleep with the typical PowerPoint-boring-syndrome... And this app surpassed all expectations! Thanks for the feedback, kopiert. We do offer a month-to-month subscription that is significantly less expensive than £100 per year. © 2018 Haiku Deck Inc.